J.T. 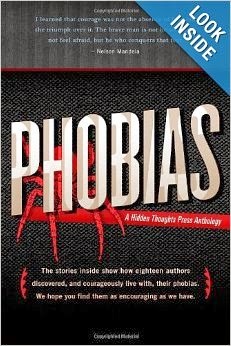 Evans’ short story, One-Thousand Eighty Degrees, was published in Phobias: A Collection of True Stories (ISBN: 978-0615949857, Paperback, ebook, 102 pages) on January 11, 2014 by Hidden Thoughts Press. It is available on Amazon. Over 60 million people in the United States and Great Britain are estimated to have phobias. On these pages, you will find eighteen stories and one poem by individuals who courageously face each day, and each night, knowing life will throw many things, both good and difficult, in their path. And yet, they go on. Read, applaud, and be grateful for your own life. J.T. is a writer of fantasy, science fiction, and horror. He has actively been writing since he discovered a local writers group in 2006. He joined the Pikes Peak Writers in late 2008 and attended his first conference in 2010. In that time, he has worked his way up the ranks in Pikes Peak Writers from "chair mover" and "auction guard" to webmaster and president of the organization. You can find him at http://jtevans.net/.